A 41-year-old woman was referred to an orthopedic surgeon. She had a history of progressive lumbar scoliosis secondary to spasticity from congenital diastematomyelia. The orthopedic surgeon planned a two-stage surgical correction of the scoliosis. The first operative stage was uneventful and consisted of an anterior lumbar interbody fusion with instrumentation at L4-5 and L5-S1. The second stage of surgery — a posterior fusion and instrumentation from T8-S1 — was planned for the next day. Lab work obtained before the second surgery indicated the patient’s hematocrit was 27.5%. To control intraoperative hemorrhage, the orthopedic surgeon requested hypotensive anesthesia. The anesthesiologist used labetatol to induce a hypotensive state. The patient was under anesthesia for 7.5 hours due to the complicated nature of surgery. Because the patient was in the prone position during surgery, a cut-out space pillow was used as facial padding. The anesthesiologist used an arterial line and central venous pressure monitoring. Blood loss during the procedure was 1200 cc with the patient receiving 6000 cc of crystalloid solution, 700 cc of cell saver, and one unit of packed red blood cells. The anesthesiologist maintained the patient’s systolic pressure below 70 mm Hg and the diastolic at 30 mm Hg for several hours. However, the mean blood pressure was not recorded. Throughout the procedure, the patient’s central venous pressure was maintained at 14-16 mm Hg. The patient’s total urine output was 302 ml. No hemoglobin or hematocrit levels were obtained during the procedure. The first postoperative hematocrit was obtained two hours after the surgery and was reported at 22.5%. 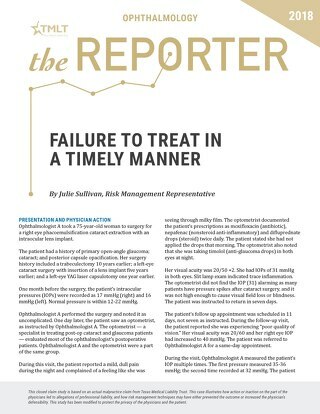 The day after surgery, the patient experienced facial edema and complained of blurred vision, which was greater in the left eye. 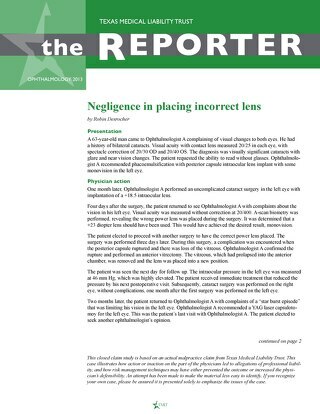 An ophthalmologist diagnosed intraoperative ischemic optic neuropathy (ION), most likely caused by a relative lack of perfusion to the optic nerve. There was no evidence of optic nerve damage that could be identified with fundus examination. To improve perfusion to the optic nerve, the patient’s hematocrit was kept above 30%. She was given corticosteroids and started on hyperbaric oxygen therapy. The patient’s vision improved and she was discharged eight days after the surgery. 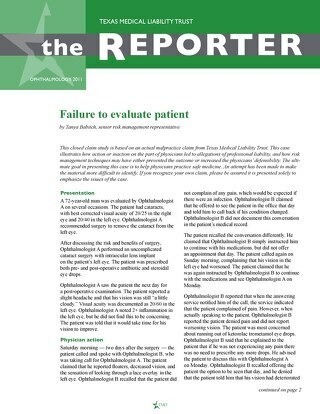 At discharge, the patient’s vision was 20/40 in the right eye and 20/400 in the left. She continued to see an ophthalmologist with a final outcome of tunnel-type vision with holes in her vision. Although the patient has some vision, she is classified as legally blind in the left eye and Social Security has determined she is totally disabled. A lawsuit was filed against the anesthesiologist, alleging the patient suffered vision loss due to the development of ION. 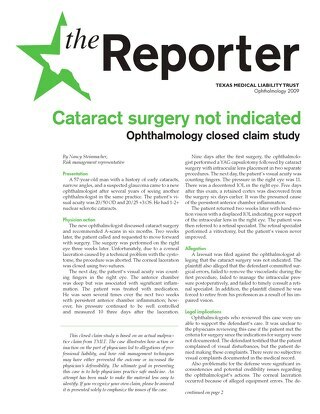 Specifically, it was contended that the injury was the direct result of the death of retinal cells caused by a lack of oxygen during surgery. The plaintiff’s experts theorized that the lack of oxygen was brought about by the hypotensive condition during the prolonged surgery; the anemic condition before and during surgery; and the pressure of a prolonged surgery in the prone position. Likewise, the urine output during surgery was insufficient and an indication that there was inadequate perfusion of the patient’s kidneys and other organs. Anesthesiologists who reviewed this case for the defense were generally critical of the defendant’s actions. The reviewers indicated that the low preoperative H&H warranted repeat blood work during surgery for treatment of anemia via blood transfusions. They also stated the mean arterial pressures should have been documented during the surgery. Since these values were not recorded, it would be difficult to overcome the theory that the patient’s blood pressure was too low for too long. 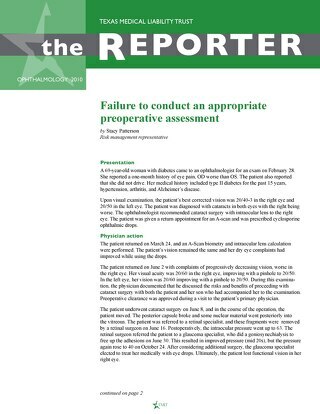 Given the minimal recorded urine output, the reviewers indicated that the patient’s kidneys and other organs were likely inadequately profused. The reviewers — along with the patient’s ophthalmologist — indicated the anemia, eye padding pressure, hypotension, prone position, and extended length of the procedure were all risk factors associated with the development of ION. The American Society of Anesthesiologists’ (ASA) document “Practice Advisory for Perioperative Visual Loss Associated with Spine Surgery: An Updated Report by the American Society of Anesthesiologists Task Force on Perioperative Visual Loss,” states that ION is an uncommon outcome. Yet there are several issues that need to be considered to avoid ION. The risk of perioperative ION may be increased in patients who undergo prolonged procedures, have substantial blood loss, or both. 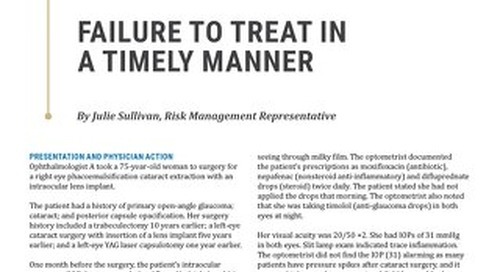 Consider informing patients in whom prolonged procedures, substantial blood loss, or both are anticipated that there is a small, unpredictable risk of perioperative visual loss. Systemic blood pressure should be monitored continually in high-risk patients. Hemoglobin and hematocrit values should be monitored periodically during surgery in high-risk patients who experience substantial blood loss. That a high-risk patient’s vision should be assessed when the patient becomes alert (e.g., in the recovery room, intensive care unit, or nursing floor). 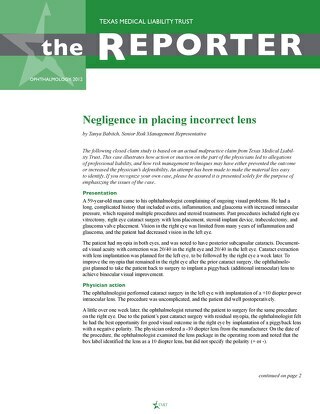 If there is concern regarding potential visual loss, an urgent ophthalmologic consultation should be obtained to determine its cause. No matter what treatment is given, it should be documented in the patient’s chart. In this case, there was no documentation of the patient’s mean blood pressure and no proof that the monitoring actually occurred. If a conscious decision was made not to monitor hemoglobin and hematocrit, this rationale should be documented. If the risk of ION was recognized during the preoperative evaluation, documenting the discussion of the risk and the patient’s understanding of the risk is recommended. 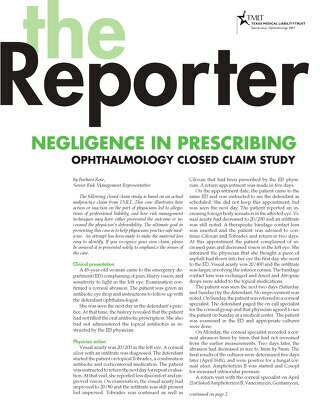 Poor outcomes can occur even with careful monitoring, but lack of documentation makes cases more difficult to defend. If the monitoring is not documented, there can be a strong argument on behalf of the plaintiff that it never took place. The case was settled on behalf of the anesthesiologist. American Society of Anesthesiologists Committee on Standards and Practice Parameters. 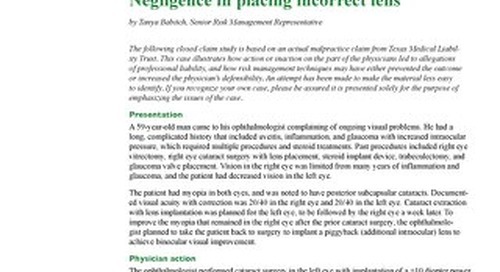 “Practice advisory for perioperative visual loss associated with spine surgery: an updated report by the American Society of Anesthesiologists Task Force on Perioperative Visual Loss.” Anesthesiology. February 2012. 116(2): 274–285. Available at http://journals.lww.com/anesthesiology/Fulltext/2012/02000/Practice_Advisory_for_Perioperative_Visual_Loss.12.aspx.